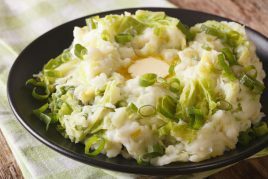 A St Patrick’s Day special, colcannon is a spruced-up bubble and squeak-style mash potato, made with cabbage or kale and leeks or spring onions. Serve with a knob of butter and something hearty like sausages or roast meat. Boil the potatoes for about 15-20, until tender. Drain and put to one side. In the saucepan, melt the butter and add the cabbage or kale and leeks or onions and gently cook until wilted (not fried). Pour the milk and simmer gently until soft. Add the potatoes to the mixture and stir well with a fork, so it’s coarsely mashed and heated through. Make a well in the centre and pour in the melted butter. Mix well. Add an extra knob of butter, a pinch of salt and some freshly ground black pepper to serve.